The game originally released as Operation Flashpoint is discontinued. Free update to Arma: Cold War Assault is available to owners of the original copy of the original Operation Flashpoint: Cold War Crisis. 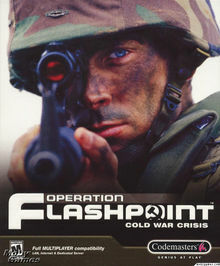 The world famous Operation Flashpoint (OFP) series of games began with Operation Flashpoint: Cold War Crisis in 2001, produced by BI and published by Codemasters. Codemasters then produced and published an add-on campaign for the original title called Red Hammer. Then in 2002, BI produced another version of the game (as an expansion pack) called Operation Flashpoint: Resistance. Later, a "Game of the Year" (GOTY) edition was published by Codemasters, which included the two BIS games, plus the Red Hammer campaign. Flashpoint can be adapted and customised in many ways. The highly versatile scripting engine can even be used for Stargate-scenarios. The only limit has been the sky - unfortunately you can't make missions in space! Things that can be changed include available missions, custom vehicles, custom skies, custom special effects, custom GUI, AI, animations, and much more. Unless written otherwise in the readme, these features can be changed without losing single or multiplayer compatibility. Custom modfolders can be created to house addons of a certain kind (like the Dutch Army, or Star Wars units), or to house new Data folders which change global parameters of the game. This Category is only for information on the original Operation Flashpoint (OFP) series for the PC. Pages in category "Operation Flashpoint"